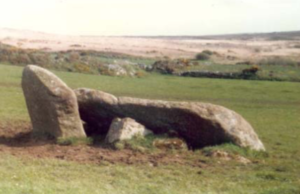 Quoits are great megalithic chamber tombs, a type of portal dolmen found only in Penwith. 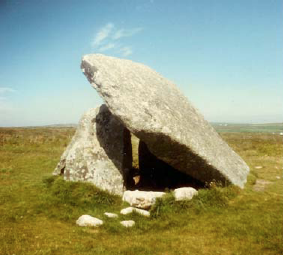 They date from the Neolithic period, circa 3500 – 2500 BC and are among the oldest stone monuments in Cornwall. 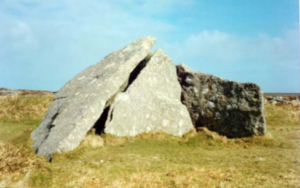 They consist of large upright stone slabs that form a chamber, roofed by a single massive capstone weighing many tonnes. 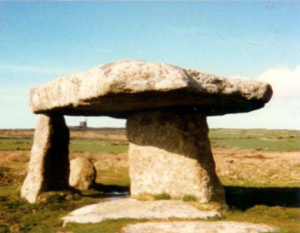 Most quoits appear to have once been surrounded by a circular or oval mound of stone, with the capstone and entrance left open. 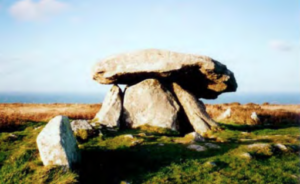 Excavations of quoits have indicated that they were not burial sites, but places where ritual burial offerings were made.